Trust Dubai’s headline grabbing developer Nakheel to make a mark at ILTM Cannes, where the world meets every year to celebrate finesse. 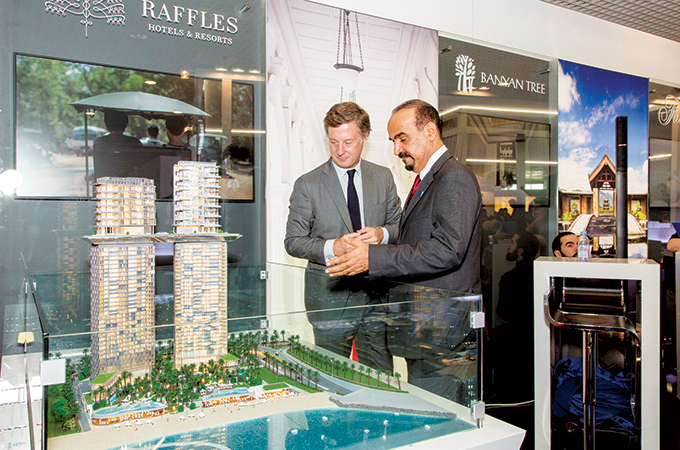 AccorHotels signed a management agreement with Dubai-based master developer Nakheel for the expansion of AccorHotels’ globally renowned luxury brand, Raffles Hotels & Resorts, at the event. The agreement, signed by Nakheel chairman Ali Rashid Lootah and Sébastien Bazin, chairman and CEO of AccorHotels, will lead to the opening of PALM360, a spectacular two tower development on the Palm Jumeirah, comprising Raffles The Palm Dubai Hotel and Raffles Residences PALM360. Set to open in 2021, PALM 360 will be the first beachside resort for Raffles in Dubai and the tallest structure on Palm Jumeirah. At almost 260 meters high, PALM360 will offer unobstructed views of Palm Jumeirah, the spectacular Arabian Gulf coastline and Dubai skyline. Its centrepiece will be a 155-m-long sky pool, connecting the towers 170 metres above the ground, from where guests can also enjoy these stunning, uninterrupted views from a unique vantage point. “Palm Jumeirah has quickly evolved into one of the most sought-after addresses in the world, offering the ultimate in luxury living and leisure. PALM360 will further enhance the island’s global appeal, which already attracts millions of visitors each year. We are delighted to partner with AccorHotels for this awe-inspiring development that will take our rapidly-growing hospitality portfolio to new heights, and become the luxury destination of choice for discerning travellers the world over,” he added. Located on Palm Jumeirah’s 11 km crescent Boardwalk, PALM360 is close to upcoming attractions such as The Palm Promenade, The Pointe and Nakheel Mall, with Dubai’s key business and leisure hubs within easy reach. The luxury property will offer guests a distinct resort feel with direct private beach access, a specialised private beach club along with thoughtful, personal and discreet service synonymous with the Raffles brand. PALM360 joins 16 other hotels that form part of Nakheel’s $1.3 billion hospitality expansion programme that is set to deliver close to 6,000 rooms and hotel apartments across Dubai. The first two hotels, at Dragon Mart and Ibn Battuta Mall, opened last year, with the rest under construction or development.